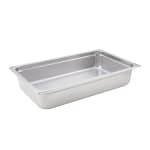 This Winco heavy weight steam table pan is full size and 4" deep to accommodate a variety of food sizes. Ideal for shrimp, vegetables, and meats this pan is an ideal addition to any restaurant with a steam table! This durable, long lasting full size steam table pan from Winco is ideal for use with steam tables. Constructed of stainless steel this steam table pan is simple to clean and resists corrosions, dents, scratches and stains. Designed with anti-jamming construction, this steam table pan is perfect for those who want easy storage and stackablity.